Instead of buying frozen rolls for Easter dinner, why not make some from scratch? These light, buttery rolls are easy to make, and look beautiful in a serving basket. After you make the quick yeast dough and let it rise, roll individual triangles into crescent shapes. They puff up gorgeously in the oven, with a light brown crust. Serve these fluffy rolls with plenty of creamy butter. RecipeSavants.com Instead of buying frozen rolls for Easter dinner, why not make some from scratch? These light, buttery rolls are easy to make, and look beautiful in a serving basket. After you make the quick yeast dough and let it rise, roll individual triangles into crescent shapes. They puff up gorgeously in the oven, with a light brown crust. Serve these fluffy rolls with plenty of creamy butter. Smart Recipes, American Recipes, Eggs,Dairy Recipes, Recipes Eggs,Dairy American Butterhorn Rolls PT35M Serves 10 Ingredients: 1 Tablespoon Dry Active Yeast 0.5 Cup Sugar 0.75 Teaspoon Salt 1 Cup Milk 2 Eggs 4.5 Cups All-Purpose Flour 0.5 Cup Butter Mix milk, eggs, salt, yeast and sugar in a bowl. Add half of the flour to the mixture and beat well. Stir in melted butter and remaining flour. Mix again to form a dough. Knead the dough to form a smooth ball of dough. Cover it up and let it rise in a warm place for 2 hours. Cut the dough in half and roll each half into a 1/4-inch-thick round sheet. Brush dough with butter if desired. Slice the dough sheet into 16 pie-shaped pieces. Start rolling each piece from its wide end towards the top. The tip should be kept at an equal distance from each end of the dough roll. Place all the rolls on a greased cookie sheet. Place each roll with its tip underneath the roll to secure its shape properly. Allow the dough to rise, doubling in size. 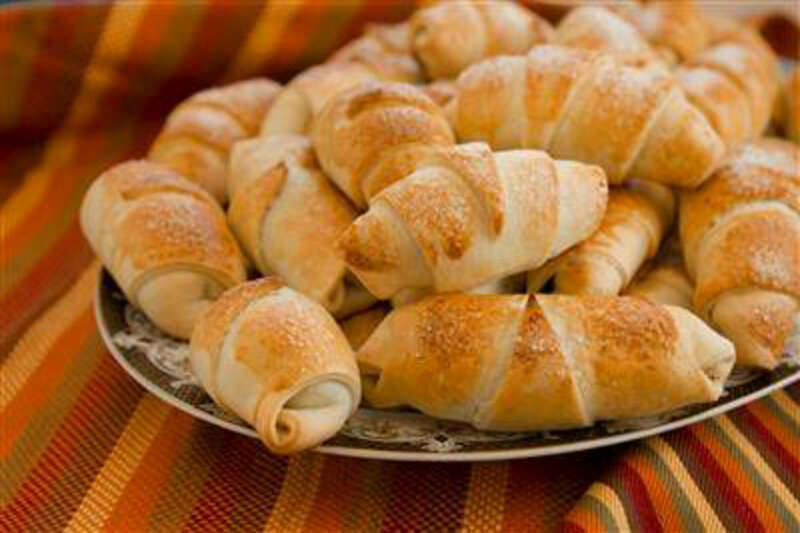 Preheat the oven to 375 degrees, and bake the rolls for 12 to 15 minutes in an oven.